This is a scheduled post and a stupid one at that as I will explain later. Hopefully I am sunning myself on the beautiful island of Lesvos or am partaking of the waters , and no, not what you are thinking that I am on the gin ( if truth be known I am more likely than not on the gin ) this island is the third largest in Greece and well-known for its hot springs which supposedly have healing properties so hopefully I will return revitalized and rejuvenated and all manner of re things. Over at Addicted to Stamps its time for our next challenge which is a sketch and no I’m not going to show you the sketch as I don’t want to confuse you as my card bears absolutely no resemblance to it ! Due to me being a very dizzy blond senior when I saw the email with the sketch I only paid attention to half of it. Now for the past week or so I have had serious lack of internet and have been unable to access the Addicted to Stamps admin blog let alone anyone elses. So when I went to upload my card I saw that I had followed the sketch incorrectly but didn’t have time to make a new one so………. in order to share something with you here is my card ,please DO NOT USE THIS FOR INSPIRATION !!!!! head on over to Addicted to Stamps to see what the other members of the DT have come up with ( They can all read ) !!!!! and have followed the sketch beautifully. I used Spellbinders dies to make the aperture and co coordinating Justrite stamp inked with Rich Razzlebury by SU a tiny weeny bit of colouring on the flowers with Copics ( I bought them so I’m using them ! ) 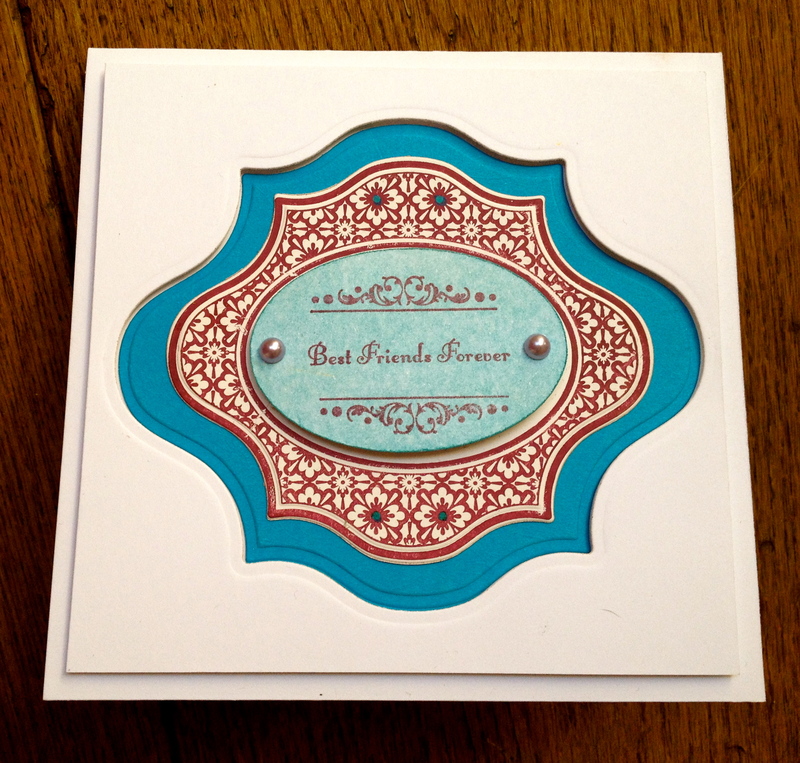 The sentiment is also by Justrite stamped with Marina Mist by SU and the oval is coloured with Pan Pastels. I think I have more blue on this one than I did in our Addicted to Stamps blue challenge, oh dear ! Please excuse the lack of commenting on your blogs but I promise I will make it up to you upon my return , this is the first holiday I have had with hubby for a few years and as some of you may remember I spent a long time too- ing and fro -ing to the UK last year to support my dear friend Maria who lost her husband to Cancer at Christmas so was unable to take a little break with Teo. He really was a rock through it all , not only did he work continually in our business and look after our children and doglets but he was a huge crutch emotionally for me and I love him dearly. Enough of the soppy chat, wishing you all well and will catch up as best I can upon my return. Have a wonderful rejuvenating holiday! It’s a beautiful card, even if it doesn’t follow the sketch. Ever so elegant. Πολύ ιδιαίτερη και όμορφη κάρτα!!!!! A beautiful card with the most perfect of sentiments. As for soppy chat – I say it was straight from the heart chat and rightly so. Your husband sounds an amazing man and how lovely you had that incredible support through such a tough time in your life. I hope you are both enjoying this time to yourselves. Hi Marie. What are you like!! 🙂 Gorgeous card. Enjoy your holiday. Your card is pure elegance! Hope you are having a lovely relaxing holiday! Fabulous card, Marie! I love JustRite stamps…especially those that have the coordinating Spellbinders…perfect match! Hi Marie, I do hope your having/have had a fabulous time with your other half, and not had too much gin. I love your card, which of course I won’t use for inspiration – those dies and stamps do look fabulous, I must say. Were they from aintree? Not long now (6 days and counting) and I will officially have a “senior” title, lol! Hi Marie. I hope you’re enjoying your holiday and the waters. Your card is lovely. My dear Marie, sketch or not sketch… your card is stunning!!! I like your colour tones and your embossing and stamping are perfect! Relax as more as you can because there is only one more month left for autumn! Hugs and thank you for always leaving me so nice comments. Hi Marie, whether you followed the sketch or not, this is fantastic! I love the colour combination and the shape of the aperture. Gorgeous! Hope you’ve had a fab holiday. Dave has the all clear to go on holiday but everything not fully resolved yet. Hello Marie! Lovely card! And I love the compination of colors! Hope you had great time at Lesvos!